Minute 003: Make 'er Hot! Tom Gire is one of the principals of Brand X Music, a major music composition house for feature and film trailer soundtracks. 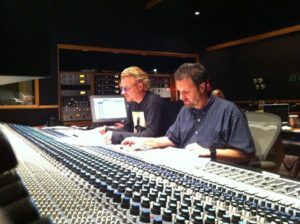 He’s composed and arranged music from films as varied as Pirates of the Caribbean 2 to Transformers: Dark of the Moon. If you’ve seen a movie trailer for a major action feature film, Tom probably put the music you’re enjoying in it. Oh, and he’s also the fellow who created our amazing opening / closing themes! Peevy is telling Clifford that if he treats the Gee Bee right, she’ll take them all the way to the Nationals. “Let’s make some history,” says Cliff. “Okay,” says Peevy, nodding his head as he closes the cockpit canopy. The mechanics step away from the aircraft. “Crank her up, Goose!” says Cliff. “Hot and brakes!” replies Cliff. Goose pushes down hard on the propeller, and the engine engages. Cliff revs the engine and the plane begins to move forward under its own power. 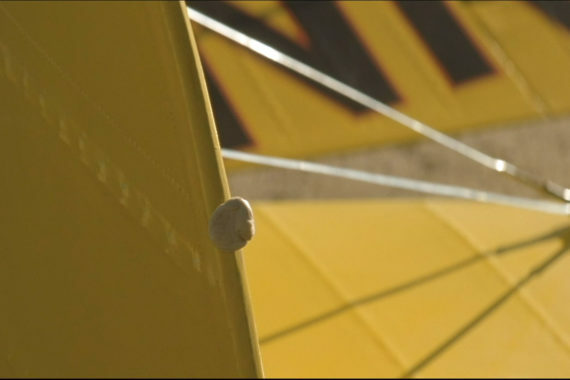 Peevy reaches over to the rudder and removes the “lucky gum” Cliff placed there earlier. Malcolm walks along with the Gee Bee next to the left wing. 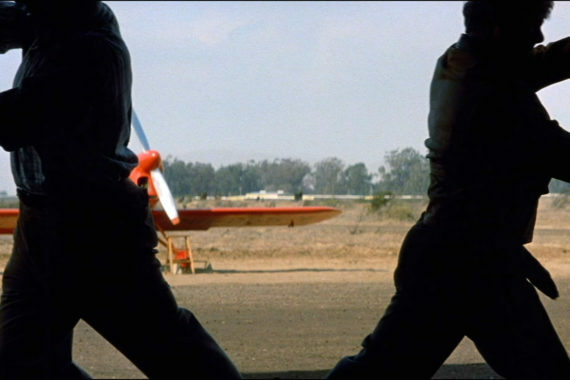 Skeets, Goose, and a third airfield hand wave from behind the Gee Bee as Cliff turns the aircraft onto the runway. Skeets turns his head away as the prop blast catches them. The scene changes to a view of structures alongside the main runway of Chaplin Field. Wooden oil derrick stand in the bean field. Hangar No. 1 shelters a biplane with two onlookers. To the right of Hangar 1 is a white high-wing monoplane. At right is Bigelow’s hangar, with onlookers in the control tower. The Gee Bee taxis from the right to the left of the screen. The scene changes again to the end of the runway, as Cliff steers his craft to pivot for take-off. Scene changes again, as the camera looks down the length of the runway. On the left are the Chaplain Field hangars and a large red and white racing pylon. To the right of the field are the air race viewing stands. The Gee Bee closes toward the camera in the center of the screen. The Gee Bee slows to turn around.